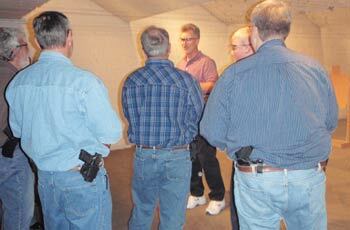 Reservation Policy: In order to reserve your seat in class, all A & S Indoor Pistol Range classes must be paid in full. A reservation not paid in full may be offered to another student. Cancellation Policy: There are no refunds on classes. No cancellations will be accepted within seven (7) days before the start of class. In order to be moved to another class, your seat in the class must be filled by another student. Class Starting Times: Please arrive at A & S Indoor Pistol Range at least fifteen minutes before the scheduled start time of class. Classes will begin at their scheduled time and reviewing for a tardy student is not always possible. Prepaid Private Instruction: If you must reschedule your appointment, a 24 hour advance notice is required. Otherwise, prepayment amount is considered redeemed. Equipment: Some of A & S Indoor Pistol Range classes require you to have specific equipment. For example: a class may require a holster and speed loaders. Please inquire about equipment requirements for each class. If you need to purchase equipment, please do so prior to the day of class. Class Conduct: Students who exhibit unsafe behavior, fail to follow the appropriate Range Rules or neglect to follow the direction of the instructor will be given a warning for their first offense. If the student continues this unsafe behavior, the student will be asked to leave the class. There are no refunds, credit or rescheduling for a student that was asked to leave the class.